Imagine this: One summer you take your grade-school son to a professional baseball game, and he takes it all in—the sights, sounds, smells of the ballpark. He watches the game intently, standing on his seat when those in front of him rise to see a close play at the plate, trying to make sense of this new, fascinating world called baseball. All of a sudden baseball becomes all he can think about. He begins following the local team on the sports channel and in the newspaper. He’s out in the backyard, throwing a tennis ball against the back of your garage for hours on end, and whenever he gets the chance, he’s playing pickup games in the street with his friends. It’s all you can do to get him to change clothes after school before he races out with glove and bat to practice. He lives and breathes baseball. Not needing any more hints, the next spring you sign him up for a youth league in town. When you drop him off at practice, everything seems normal. Several groups of players are clustered on different points of the diamond, each led by a coach. One coach guides his group through a bunting drill, another group practices running the bases, yet another catches fly balls. Bodies move in the ordered chaos of a youth sports practice. When you pick up your son, he seems happy, his face flush, as he talks about how he worked on his batting stance and fielding grounders. You take him to several such practices, and each seems the same. 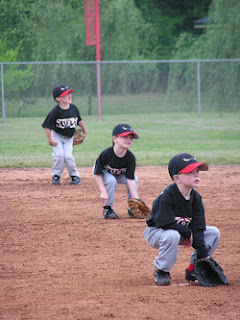 At one practice he learns to turn a double-play, at another he learns the infield-fly rule, and so on. With each practice he grows in his skills and knowledge of the game. “Okay,” you say, but after April has turned to May and a dozen practices have gone by, you begin to get curious. Your son, you notice, has grown less and less enthusiastic about playing baseball. He no longer gets in the car and tells you what particular aspect of the game he worked on that day; now he sits in the passenger seat, sullen, offering nothing. “What did you do at practice today?” you ask, and his response is curt—“Running the bases” or “covering home on a passed ball”—and he returns to silence and staring out the window. Gone is the boy who would run from the school bus to change into his baseball clothes and race outside to play. By now your mouth is fully agape. Actually, you do start to argue, but the coach hasn’t finished. Now he’s finally done. Understanding that arguing won’t work here, you thank him quietly, and take your son home. Your next move, of course, is to withdraw your son from the league, and your son does not object, because the endless practicing had already killed his enthusiasm for playing baseball. I'll end, rather cryptically, here. But I hope in this hypothetical baseball league I've shown what can go horribly wrong, in any attempt to educate, when desire and beauty are cast off in mad pursuit of what is quantifiable.